I just received my shipment and am very happy with my purchase. Great service, great price, fast shipping. I will be ordering again. Thank you!! Our goal is for QuiltHome.com to become one of your valued sources of quality quilting supplies, information, and inspiration. We welcome your comments, suggestions, observations, and bug reports. Please leave your Comments HERE. 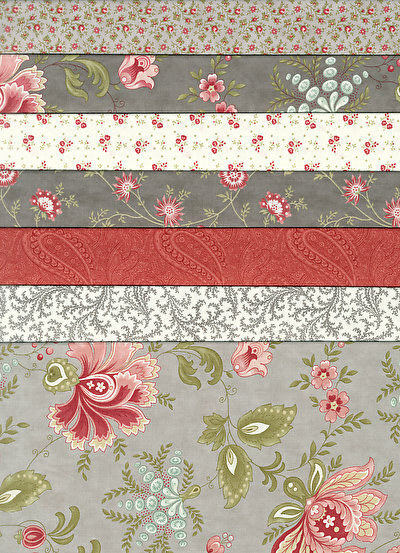 A Half Yard Bundle - QuiltHome style! Our angels have done it again! This product is our own take on the half yard bundle...whether stash building, quilting, or an extra special gift to give to a friend, this bundle is beautifully packaged just for you! This Porcelain Half Yard gift pack includes 7 half yards in the Dove palette from 3 Sisters&apos; Porcelain collection. Check out our new Design CartTM below, you can move fabric around so every page becomes a design board!